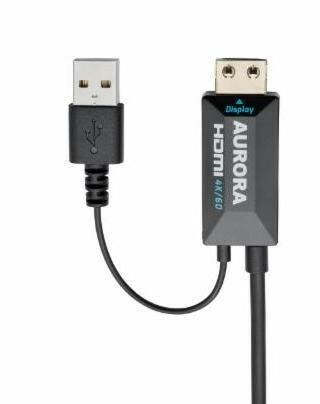 Tributaries has announced two more HDMI cables to its 18Gbps line-up, a 40-meter AURORA and a passive five-meter UHDP PRO cable. Both have been certified by DPL Labs and ISF for 18Gbps performance guaranteeing the passing of a 4K/60 HDR signal. The 40 meter AURORA, hybrid fiber optic cable, is the most stable long length 18Gbps solution available, according to Orlando-based Tributaries. “These are the best AOC I have seen”, said Matt Murray of AVPRO Store, “they will actually pass HDMI 2.0 w/o equalization. It is rather impressive; I had not seen it before.” The AURORA is ‘marvel of electro-optical engineering,’ claims Tributaries, as it combines the best of worlds, both glass and copper; glass transports the video/audio/clock and control signals while the copper carries the Digital Display Channel (DDC) responsible for the 2-way communication of EDID and HDCP. The UHDP PRO 5 meter cable is now offered in a passive model. Why is passive such a big deal? As Tributaries had emphasized in its March news announcing the 10-meter TITAN product, passive HDMI cables are ‘preferred’ by installers over active. In addition to incompatibility issues with other electronics, active cables are directional and will not work if reversed. The active end of the cable must be connected to a display and requires power to supply the on-board electronics; typically, these cables harvest their power from unused TMDS voltages. This method works well as long as the source which drives the 5V line has an adequate output. If the source voltage is too low it will draw down the vital 5 volt line. Passive cables are bi-directional and voltage agnostic, making any long run installation simpler and more stable. The new passive 5 meter UHDP Pro replaces the previously 10.2Gbps active cable of the same length. Tributaries has not provided any information on pricing at this stage, but if consistent with past form, you might have to get out the smelling salts when you finally confront your dealer. With that said, Tributaries clearly is spearheading the manufacture of fine cables with robust quality control standards, and if decking out your AV system with the very best is your priority, then perhaps they should be on your investigation list.